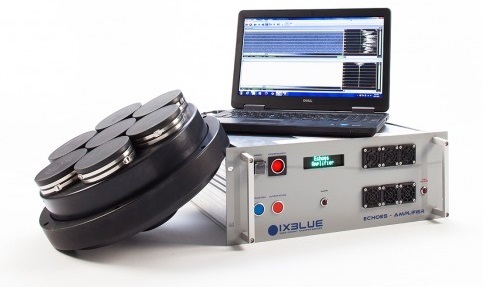 iXBlue Echoes 10000 is an ultra high resolution sub-bottom profiler designed for shallow water environments. It consists on an array of 7 Tonpilz transducers that deliver a true flat spectrum and has a directivity of 20⁰. It works on a range of frequencies from 5 to 15 kHz, providing a resolution down to 8 cm. It is pole-mounted and has a reduced size. The data are acquired and processed using Delph Seismic Software Package, a complete solution for acquisition, processing and interpretation, which is designed to provide geologists, geophysicists and engineers with easy access to all data collected from high-resolution seismic and sub-bottom profilers. The software package provides interpretation and 3D mapping.